On September 6, 1522, the \"Victoria\" sailed into harbor in southern Spain. The battered vessel and its 18 sailors were all that remained of a fleet that had departed three years before. Yet her voyage was considered a success, for the \"Victoria\" had achieved something unprecedented – the first circumnavigation of the globe. 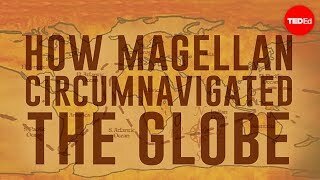 Ewandro Magalhaes shares the story of Magellan’s journey. Lesson by Ewandro Magalhaes, animation by TED-Ed. On September 6, 1522, the "Victoria" sailed into harbor in southern Spain. The battered vessel and its 18 sailors were all that remained of a fleet that had departed three years before. Yet her voyage was considered a success for the "Victoria" had achieved something unprecedented: the first circumnavigation of the globe. But this story really begins in 1494, two years after Columbus's voyage on behalf of Spain. Columbus's discovery had prompted the Catholic Spanish rulers to turn to the Pope to preempt any claims by Portugal to the new lands.. The Pope resolved this dispute by drawing an imaginary line on the world map..
Spain had the right to claim territories west of the divide, and Portugal to the east. Spain and Portugal, the two major seafaring super powers at the time, agreed to these terms in what came to be called the Treaty of Tordesillas..
At the time, these nations had their eyes on the same prize: trade routes to the Spice Islands in today's Indonesia. The spices found there, which were used as seasonings, food preservatives, and aphrodisiacs, were worth many times their weight in gold. But because of Portugal's control over eastern sea routes, Spain's only viable option was to sail west. So when a Portuguese defector named Ferdinand Magellan claimed that a westward route to the Spice Islands existed, King Charles made him captain of a Spanish armada, and gave him all the resources he would need. Along with a share in the voyage's profits, he granted Magellan five ships and about 260 men. The crew included a young slave named Enrique, captured by Magellan on a previous journey to Malacca, and Antonio Pigafetta, a Venetian nobleman seeking adventure. On September 20, 1519, the fleet weighed anchor and headed southwest. After making landfall in what is now Brazil, it proceeded along the coast, exploring any water way leading inland. They were looking for the fabled passage linking east and west. As the weather worsened, the Spaniards resentment at having a Portuguese captain escalated. A full-blown mutiny soon erupted, which Magellan crushed with unspeakable cruelty. But his problems were only just beginning. During a reconnaissance mission, the "Santiago" was wrecked by a storm. Then while exploring a narrow waterway, the captain of the "San Antonio" took the first opportunity to slip away and sail back home. Magellan pressed forward, and on October 21, he started exploring a navigable sea way. 27 freezing days later, the three remaining ships emerged from what we now call the Strait of Magellan into the Mar Pacifico. The fleet never expected the new ocean to be so vast. After 98 days at sea, dozens of sailors had succumbed to scurvy and famine.. When they finally reached land again, Enrique, the young slave, proved able to communicate with the natives. Their goal couldn't be far. Sailing further west, Magellan was warmly received by Rajah Humabon of Cebu.. So when the ruler asked him to help subdue and convert the rebellious chief of Mactan, the captain readily agreed. The adventure would be his last. Overconfident and severely outnumbered, Magellan's force was overwhelmed, and the native's bamboo spears ended the captain's life. Yet the voyage had to continue. Magellan's will specified that Enrique should be freed, but the expedition still needed an interpreter. With his freedom at stake, Enrique is believed to have plotted with the Rajah to have about 30 of the Spaniards killed at a feast on the beach..
Enrique was never heard from again, but if he ever made it back to Malacca, he may have been the first person to actually circumnavigate the globe.. Meanwhile, the survivors burned the Concepcion and proceeded onward. They finally reached the Spice Islands in November of 1521 and loaded up on precious cargo. But they still had to return to Spain. The "Trinidad" sank shortly after being captured by the Portuguese. The "Victoria" continued west, piloted by Juan Sebastián Elcano, one of the pardoned mutineers. Against all odds, the small vessel made it back to Spain with a full cargo of cloves and cinnamon, enough to cover the expedition and turn a profit. An obsessive chronicler, Pigafetta described the lands and people they encountered. With the help of a humble slave, he also compiled the world's first phrase book of native languages. His journal is the reason we can tell this story. Magellan's legacy lingers. He had galaxies and space programs named after him. Elcano, too, was celebrated in Spain with a coat of arms and his face on currency and stamps. United by fate, the survivors and the hundreds who sacrificed their lives challenged conventional wisdom and completed a historic journey once thought impossible.